Not all tinned tomatoes are created equal. This is something that took me a while to discover. As a student tinned tomatoes were a staple of my food shop due to their sheer versatility. Once you can make a simple tomato sauce the world is your oyster. Serve it with pasta, make it into chilli or bolognaise or combine both into a lasagne. It's one of the building blocks of basic cooking skills. However as a student with limited budget I always opted for the cheapest supermarket own brand or basics version. Big mistake. Buying cheap tinned tomatoes is a false economy. It's definitely worth spending a wee bit more for a quality brand and I'm delighted to be teaming up as an ambassador with with premium Italian tomato brand Cirio. 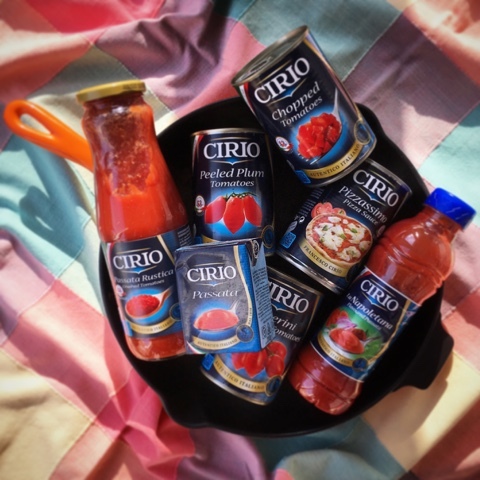 Founded in Italy 1856, Cirio make a wonderful range of tins, jars and cartons of tomato products. Although it is tempting to reach for the cheapest tinned tomatoes in the supermarket you can tell the Cirio difference as soon as you pick up the can. With cheaper brands there is a lot of sloshing about as there will be a lot of juice and not a lot of tomato. When you open the tin the colour comparison is stark, their tomatoes are actually bright deep red, the chopped product is thick and whole tomato flesh firm. But the real difference comes in taste and intensity of flavour. Their products are simply richer, sweeter, less acidic and bursting with tomatoeyness. Give Cirio a try and you'll be converted. 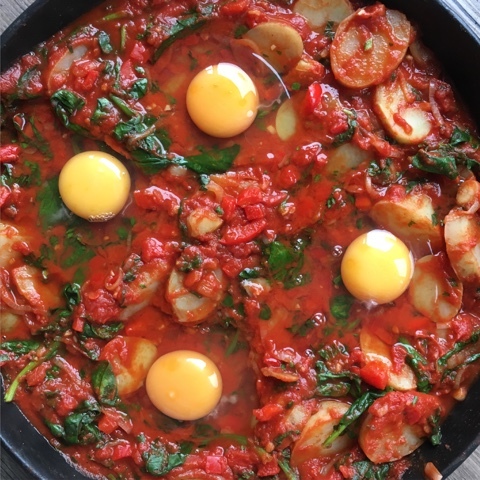 The recipe I'm sharing today is for Shakshuka which is essentially eggs baked in a tomato based sauce. It works well as a Vegetarian dish but meat eaters could add spicy chorizo for an extra kick of flavour. 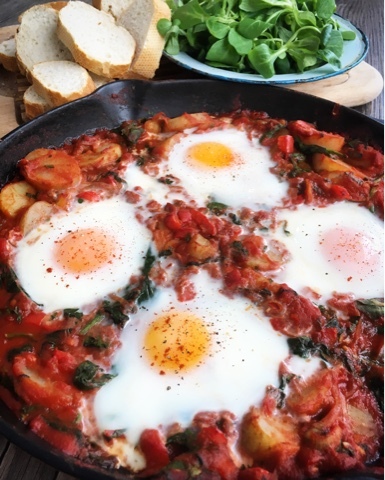 Shakshuka has its origins in North Africa and is a simple rustic one pot dish in which the quality of the tomatoes can really shine through. The name means to mix up or shake up and in my recipe I've mixed the traditional tomatoes and eggs with seasonal Jersey Royal potatoes. It makes a perfect brunch or supper dish and you can spice it up or down according to you own taste. I'm a bit of a woose so go heavy on the smoked paprika and light on the chilli. 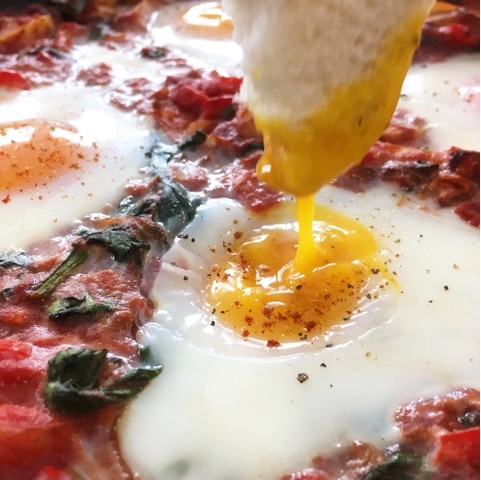 Shakshuka is frugal food that's full of flavour, but only if you splash out a wee bit on your key ingredient. Boil the potatoes for approximately 15 minutes or until tender. Drain well and thickly slice. Whist the potatoes are cooking add a splash of rapeseed to to a frying pan - ideally an oven proof one. Fry the onion, garlic and peppers until softened. Stir through the spinach and allow it to wilt down before adding the precooked sliced potatoes. Season with the basil, parsley, smoked paprika, chilli and freshly ground salt and black pepper. Make 4 shallow hollows in the mixture and crack and egg into each. Bake for 10-12 minutes or until the eggs are cooked to your liking. Sprinkle the eggs with some extra smoked paprika and ground black pepper and serve with a green salad and crusty bread for dipping. For further Cirio Tomato inspiration take a look at Bintu's Joloff Spaghetti and Helen's Slow Cooked Beef Ragu and Fagioli all’uccelletto. Disclosure : This is a commissioned recipe for Cirio. All opinions expressed are my own. I am a huuuuuuuuuge Cirio fan and have no other tomatoes in my pantry. Love em. Plus I need to try your version of shakshuka. They are such a storecupboard staple. 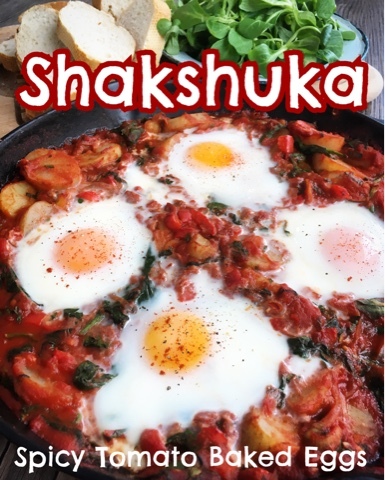 Hope you enjoy my version of shakshuka. 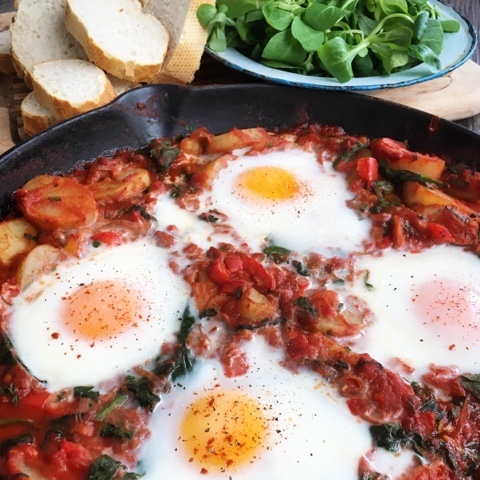 Wow what a fab recipe, I adore Shakshuka - would happily eat it for breakfast, lunch or dinner! Totally agree with you on tinned tomato quality being important as well! Its definitely a dish that could work at any time of the day, providing the tomatoes are good quality. If you only buy the cheap ones you have absolutely no idea how tinned tomatoes really should taste! I love shakshuka, it's one of my absolute favourites. 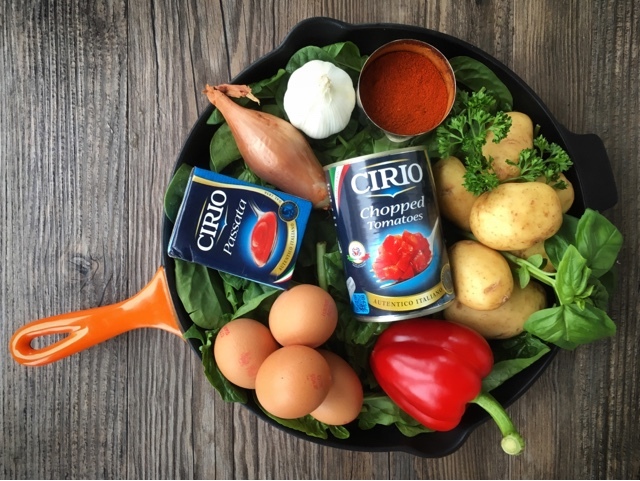 Your potato and tinned tomato version sounds like one I need to try, but possibly only if I use Cirio tomatotes - which I've never tried before. Do look out for Cirio next time you are shopping and give them a try. I am a big fan of Cirio and buy it by the dozen since I use tomatoes in lots of my vegetarian cooking. Your dish looks great can you confirm where the potato slices are added in the recipe??? Do you add them in as a layer or serve them as a side?? Reading over the recipe again I realise I wasn't very clear as to when the potatoes should be added! Have rectified now and thanks for pointing it out. Drooling over here! 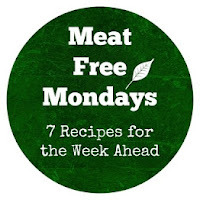 This is a go to feed in our household, and not just for breakfast either. :) We actually stopped buying tinned tomatoes for a long time because of the baddies in them, but have found a number of great products to use again. Love your recipe.